With its dark secrets and dastardly deeds, Baddesley Clinton in Warwickshire has a rich history, as Chris Upton reports. If you’ve ventured that way, you’ll know that Packwood House in Warwickshire is the place of yews. Its close neighbour, Baddesley Clinton, however, is definitely non-yew. A home to Catholics when such beliefs were a criminal offence, it is a manor house that never became grandly manorial – the owners were never rich enough. The Elizabethan owner, Henry Ferrers, nicknamed “The Antiquary”, had something of the D’Urbervilles about him. An unrivalled expert on genealogies and family heraldry, his own inheritance declined into debt and he was forced to sell off most of his land, along with the family silver. He had just enough left to fill the windows with faintly nostalgic heraldic glass, reflecting on glories past. But the modern visitor to Baddesley Clinton has to be grateful to the Ferrers family for their economic mismanagement. Had there been enough funds to invest in it, then this house would surely have become a Jacobean extravaganza, or yet another elegant Georgian mansion (of which there are more than enough) nestling in the Warwickshire countryside, the woods around it turned into long avenues and formal gardens. As it is, Baddesley looks almost too good to be true, the perfect embodiment of the Middle Ages. A moated manor house and yet only 10 miles from Birmingham? Surely not. If you had scripted Baddesley, you could hardly get it so perfectly right. And the obligatory dastardly deeds and dark secrets are there too, just as they ought to be. The dastardly deed was committed by Nicholas Brome in the late 15th century. He caught the local parson in the parlour, “chockinge his wife under the chinne”, and promptly despatched him with his trusty blade. Nicholas made it up with the Almighty by rebuilding the local church in expiation for this killing, and one or two others he wished to be taken into account. The dark secrets, of course, are in the priest-holes, designed by Nicholas Owen, of which Baddesley boasts no less than three. The darkest and dankest by far is formed by the old drain in the kitchen, where in 1591 nine men – Jesuit priests and lay assistants – stood silently for four hours, ankle-deep in water, while the authorities ransacked the house in search of them. But for every dark Middle Ages, there is a Renaissance, and Baddesley Clinton’s came in the 1870s. The last of the Ferrers line was Marmion Edward Ferrers (1813-84), named, I suspect, after the character in Walter Scott’s popular chivalric poem, published just five years earlier. Marmion shared the house with his wife, Rebecca, his friend Edward Heneage Dering, and Dering’s wife, Georgiana, Lady Chatterton. They had the same religious beliefs, along with a deep love of the arts and of Baddesley itself. Whatever else they may have shared is beyond speculation, but after the death of Marmion and Lady Chatterton the surviving widow and widower married, too. The four friends – known as “The Quartette” – formed an unlikely kind of Bloomsbury Group, retiring from the world to paint pictures, write novels and wrap themselves in the past. Many of the two women’s paintings are still to be seen at the house. They often adopted 17th century dress, playing out the roles that such a house clearly demanded. Architecturally, however, the main impact they had on Baddesley was to create a Catholic chapel on the first floor, Rebecca supplying the paintings and Georgiana the leather hangings, decorated with birds and flowers. There are so many portraits of Marmion and Rebecca, Edward and Georgiana at Baddesley that you might almost imagine them to be still in residence, they and the cowled Benedictine priest who was often present, too. Perhaps they are. The haunted library, however, has reputedly more to do Nicholas Broome’s flashing blade many centuries before. Baddesley only crawled reluctantly into the 20th century. Rebecca, the last survivor of the quartette, steadfastly maintained what Country Life described as “the regime of mid-Victorian England modified by the wistful love of Elizabethan manners”. There is an account left by Rebecca Dering’s last servant, describing life in the house in the 1920s, though it could easily have been the 1820s. “There was no electric light or lamps, only candles, rather trying in the winter, but we got used to it and managed quite well, but at times it was quite scary. ‘‘Our day was spent doing the usual chores. The kitchen was one of the sights of the Hall, fitted out with lovely copper saucepans and their lids arranged all round. It took two maids two mornings to clean – hard work. Since 1980, Baddesley Clinton has been in the safe custody of the National Trust. For the previous 10 years the last owner had courageously held the house together while a sufficient endowment could be found to support it. 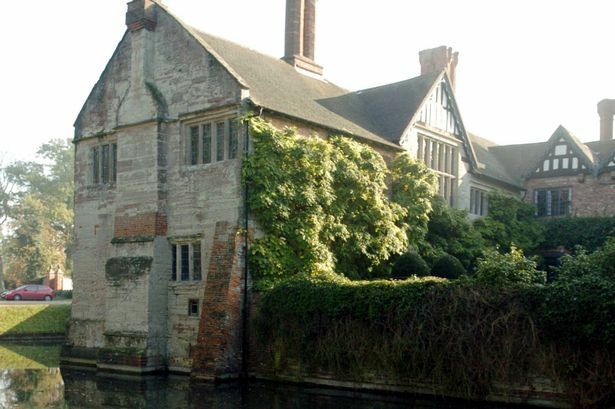 Money from the National Land Fund was used to buy Baddesley, its ghost and its memories. Five hundred years was really not too long to wait.